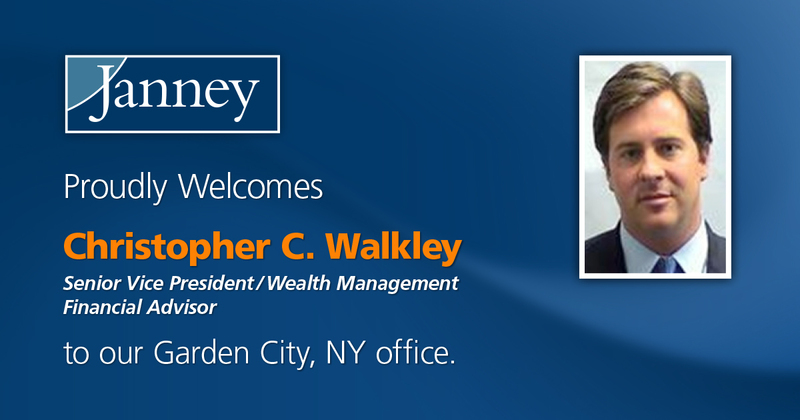 PHILADELPHIA, PA – August 28, 2017– Janney Montgomery Scott LLC (“Janney”), a leading full-service wealth management, financial services, and investment banking firm headquartered in Philadelphia, PA, announced that Christopher C. Walkley, Senior Vice President/ Wealth Management, has joined Janney’s Garden City, NY branch office. Walkley is joined at Janney by Lauren A. Matus, Private Client Assistant. Walkley and Matus were previously affiliated with Morgan Stanley. 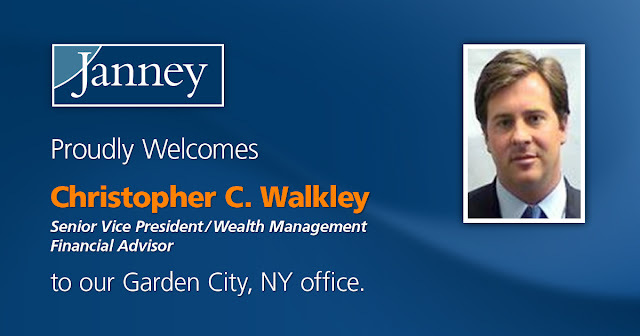 Walkley, a 21-year industry veteran, is entrusted with over $106 million in client assets. He has earned the Chartered Retirement Planning CounselorSM (CRPC®) designation from the College for Financial Planning and has studied advanced portfolio management at the University of Chicago and leadership development at the Wharton School of Business. He volunteers his time with Island Harvest, a local nonprofit that rescues and distributes food to hungry people in New York, and assists his daughter’s humanitarian efforts for the Harbor Fields Pet Awareness Committee, a club she established and organizes to promote awareness and safety for rescue pets. Additionally, he organizes drills and scrimmages with the local chapter of the Special Olympics’ soccer team. Janney’s Garden City, NY branch office is located at 1001 Franklin Avenue, Suite 202 Garden City, NY 11530.